If you’re a Magdalena Tarot Reader, you’ve become familiar with the Evolutionary Tarot, the deck I choose to use for Spring/Summer 2017. If you’ve been wondering about some of the unique facets of the deck, the answers are here! I had the chance to catch up with the creator, Richard Hartnett H.W.M. and he explained to me his vision for the deck, the use of alternative numerology, the additional cards and the process of creating the deck! This is a must read for anyone who has an interest in Tarot and creating a deck! Richard Hartnett: I started to learn Tarot in the late 80s early 90s. I felt like a lot of the cards aligned with Carl Jung’s archetypes but there were some missing, like the Teacher, for example. I started to think that maybe there were some “lost” cards of the Tarot. I meditated on that idea and came up with some cards that could be added to the deck. I read the book King, Magician, Warrior, Lover: Rediscovering the Archetypes of the Mature Masculine and I noticed that all of the masculine archetypes were included in the Tarot but when I looked at the feminine archetypes, I notices the Crone (or healer), was missing. And so I began to consider what other archetypes might be missing. I came up with several but where did they go in the Major Arcana? Thus, began a long process of figuring that out. RH: I worked on the deck for about 20 years. I created the additional cards in the 1980s/1990s and figured out where the extra cards would fit in. But I still didn’t have any artists to bring my ideas to life. That’s when a friend suggested that I use 5 different artists to create the deck instead of just one. MT: What was your biggest challenge when creating the deck? RH: My biggest challenge was finding right artists to work with who could see my vision. 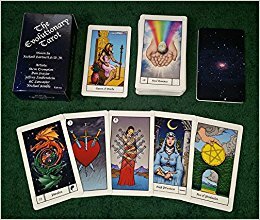 MT: How can the uniqueness of the Evolutionary Tarot enrich the reader’s experience when using the deck? RH: The reader can start out using the deck without the extra cards, until they are comfortable with them. It functions just like any other deck. You can use the deck without the extra cards. I think the key to using the deck is utilizing the cards to help tell a story – not just in terms of what is going to happen in the querent life in regards to love, luck and money – but helping the querent see how the meanings of the cards affect their spiritual evolution. This can be achieved by advising the querent to meditate on the archetype. The idea is to use the card to detach the idea from the religious idea of the soul in order to work on the ego. MT: Tell us a little bit about how someone can get their hands on the Evolutionary Tarot? How much does it cost and how can someone order a deck? RH: You can contact me through my website http://www.quantumspiritone.com/ or if you’re in the Denver area, there are 5 metaphysical shop retailers who carry the deck. The book that explains in depth the whole deck is now available as an iBook and the printed version will be out shortly. Watch my Facebook page or web site for the announcement of its availability. MT: Do you have any ideas for additional Tarot related projects in the future? RH: I’m working on a book that goes in depth with the meanings of the Tarot cards based on my philosophies. It’s ¾ the way finished so be on the lookout for it in the near future. MT: What is your vision for the Evolutionary Tarot? RH: My vision is 2 fold; I want to expand the use of the Tarot into a more evolved system and I believe this evolved tarot will assist individuals in their personal evolution. MT: Unlike most Tarot decks that utilize only 1 artist, you chose 5 artist to work with. How did you pick the lucky 5? the other artist who stayed on to see the project through to completion. Mike Kimble was my art director and he filled in where we needed help. MT: What do you have to say to all the Magdalena Tarot readers who will be enjoying y our deck over the next few months? RH: Keep an open mind as you get familiar with this new expanded Tarot deck. It can be read the old or the new way. The choice is up to you. This entry was posted in art, Astrology, Books, Evolutionary Tarot, Magdalena Tarot Partners, mysticism, mythology, numerology, occult, Qabalah, self help, spirituality, Tarot, Uncategorized, witchy, Writing and tagged art, astrology, divination, dreams, empowerment, Evolutionary Tarot, inspirational, Magdalena Tarot Partners, magick, manifestation, mantra, meditation, metaphysical, motivational, mysticism, numerology, occult, pagan, psychic, qabalah, self empowerment, self help, spiritual, tarot, tarot reading, tarot weekly forecast, wicca, witchcraft, witchy, writing. Bookmark the permalink.